We ski Mission Bay year-round once a week, and twice a week during the warmer months. We provide all the equipment and helpful instruction you need. Spring and fall are our River Trip seasons. We take up to 25 people and two boats and ski 'til our hands are raw. SIGN UP for a River Trip with your credit card or PayPal account. We have exclusive use of the slalom course on Fiesta Island in Mission Bay one Sunday afternoon each month. Great to hone your slalom skills or to learn from scratch! The Convair Waterski Club always accepts new members of all ages and abilities. Our club provides an easy and inexpensive way to enjoy watersking, wakeboarding and barefooting, and we schedule special social events throughout the year! We ski year-round in Mission Bay and take weekend camping trips to the Colorado River during the season. Our members are very social, helpful and supportive of each other, regardless of skill level. If you want to learn how to get up on two skis or a wakeboard...great. If you want to compete on the slalom course...also great. No pressure. We just want people to have fun and ski safely. The club is truly unique in the watersking service and access it offers its members. You don't need to own a boat to have fun! The club currently owns two ski boats - both MasterCrafts - plus assorted skis, wakeboards, vests, water toys, barefoot boom, wakeboarding pylon, and camping gear. All are available for Club members to enjoy upon meeting the club's requirements. 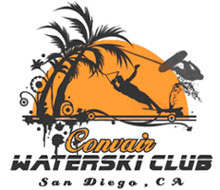 The San Diego Convair Waterski Club was originally formed as part of the General Dynamics Convair Recreation Association over 45 years ago. It is now an independent, non-profit corporation that is open to the public.